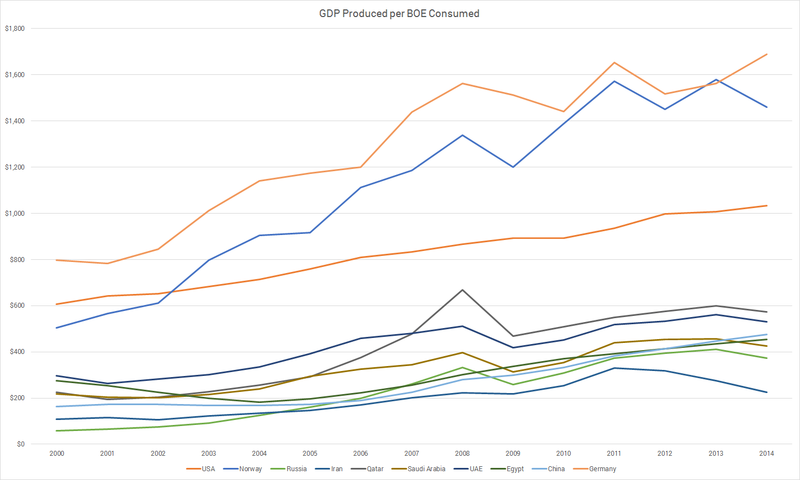 Using World Bank GDP data and BP primary energy consumption statistics, this chart shows the energy efficiency of select countries, in terms of GDP produced for each barrel of oil equivalent consumed. Among all Gulf countries, Iran performs the worst on this metric, largely a result of inefficient industries, partly a result of the sanctions regime, and heavy subsidization of energy consumption up to 2010 and the slow phase out of subsidies until 2015. In contrast, the low energy consumption, relative to GDP, of the US, Germany, and Norway portray lowering energy intensity as economies shift towards service industries. 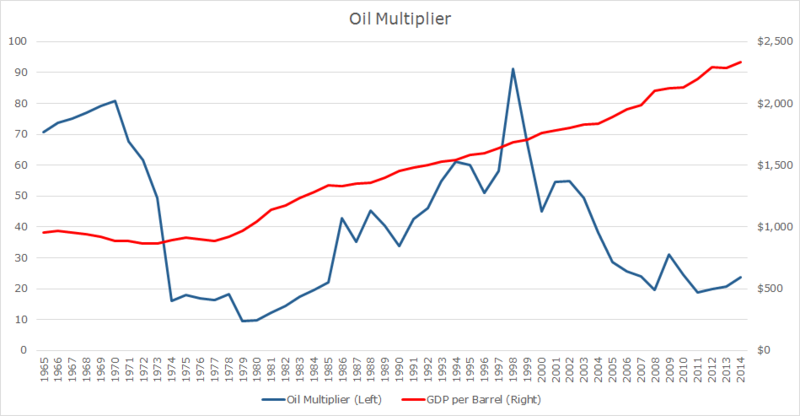 A quick post, this graph shows the oil multiplier, or how much each barrel of oil contributes to GDP as a multiple of the oil price. To create this graph, the real GDP was divided by yearly consumption to get the contribution of each barrel to GDP. The contribution to GDP was then divided by the real price of oil in 2014 USD to figure out how much each barrel contributes to GDP as a multiple of its price. The chart shows how the US economy has shifted from industry to services, thus bringing down its oil intensity, while the wide variations reflect the volatility of the price of oil. The peak multiplier of 91.17 is a function of the oil price crash after the Asian financial crisis combined with a quickly growing US economy, especially given the low oil intensity 1990s tech boom. The 1979 nadir multiple of 9.40 results from the oil price spike following the Iranian Revolution. Data Sources: St. Louis Fed Real GDP and GDP deflator. Oil consumption statistics from BP Statistical Review 2015.